Last week, I examined a handful of burning questions from all corners of Twins Territory. Topics included Minnesota's use of an opener, Sano's legal situation at home, trading Byron Buxton, and Kirilloff's potential MLB debut. This week's mailbag has even more great topics. Make sure to follow me on Twitter so you can be part of the next Twins Daily mailbag. Let's open some of this week's mail. It’s hard to predict what the organization will want to do with some of the club’s top talent. Prospects like Royce Lewis and Alex Kirilloff spent limited time in the FSL last year so both will likely end up starting 2019 back in Fort Myers (High A). However, Minnesota could be aggressive with someone like Kirilloff, who destroyed the ball last year. Both Lewis and Kirilloff are expected to spend time in Pensacola (Double A) this season. With Mauer and Dozier out of the picture, I believe the front office brought in Nelson Cruz to provide veteran leadership. This is especially true with the younger players that need to make positive strides next year. “He’s going to set a wonderful example in the way that he prepares for games and just being the person he is,” new manager Rocco Baldelli said. “That alone is going to be an asset for us going forward.” When it comes to the pitching staff, I think Kyle Gibson continues to be one of the best leaders on the team. Other veteran pitchers like Jake Odorizzi and Michael Pineda could also provide clubhouse leadership, particularly with their experience from other organizations. Between his flowing locks on the bases and his epic home run last week, Astudillo is quickly becoming a cult legend in Minnesota. Looking at the construction of the roster, one must wonder how he will fit into the club’s plans this year. Jason Castro and Mitch Garver should make almost all the team’s starts at catcher. Astudillo showed his ability to play multiple positions last season so that could make him a unique utility option. That being said, I think Garver will be the starting catcher for the foreseeable future. As fans saw last year, one injury could make Astudillo part of the team’s everyday plans. To answer the question more specifically, imagine the Twins tied atop the AL Central with the Indians on the final day of the season. Minnesota is down to Kansas City 3-1 in the bottom of the ninth. Astudillo comes off the bench for a pinch-hit three-run home run to win the division for Minnesota. He pimps the home run more than he did in the Venezuelan Winter League. I think the team needs Buxton to make the most progress next season. We’ve seen what Sano could be after his All-Star caliber season in 2017 and it would be great to see him get back to that level. Buxton has the chance to impact the game on so many different levels and Sano’s game has always had some limitations. I think Kepler is a good complementary player, but he is never going to be a guy to completely change the game for a club. Realistically, these three players all need to make improvements if the Twins are going to be competitive in the AL Central over the next five years. Minnesota has been proactive in the minor leagues by utilizing an “opener” at Double A and Triple A more frequently than at the big-league level. That should change in 2019 with new manager Rocco Baldelli. The idea behind the “opener” is that the starting pitcher can avoid the top of the line-up at the beginning of the game. Hypothetically, this would allow the starter to get further into the game. As we saw in last year’s playoffs, the Brewers used Wide Miley, a lefty, so the Dodgers stacked their line-up with righties. Then they removed him after one batter and put in a right-handed pitcher. From a manager’s perspective, he could create line-ups in a couple of different ways. The first would be to keep in their normal spots the best hitters, no matter who the opponent uses as a starter. Another way to create a line-up would be to make sure there is good balance of right- and left-handed hitters. Would it work to move the club’s three and four hitters to the five and six spot in the order? This would mean fewer at-bats for the team’s best hitters, but they could be in the line-up to face the starter in their first at-bat. I don’t think paying Keuchel makes sense. There are also some low-risk free agent options that are still on the market. 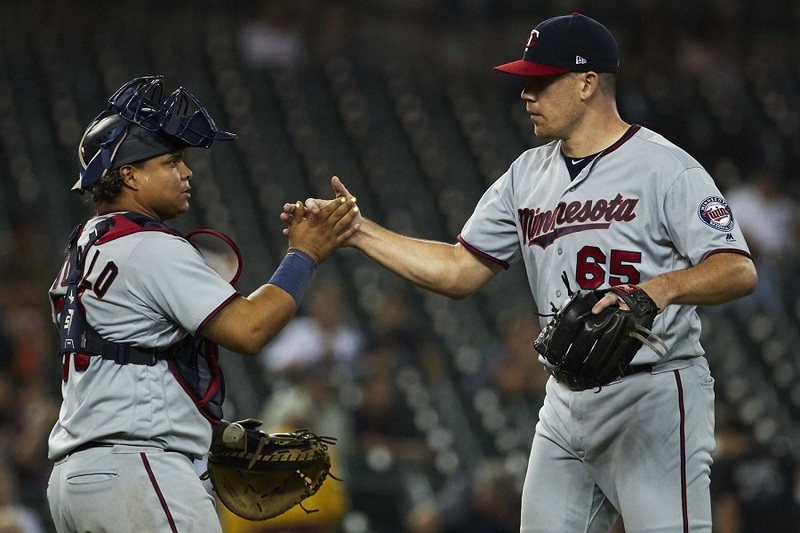 I think players like Trevor May, Tyler Duffey, Taylor Rogers, Andrew Vasquez, and even Fernando Romero could get opportunities to serve as an opener in 2019. What do you think about this week's questions? Leave a COMMENT and start the discussion. As far as the last question goes, you could probably see Gabriel Moya get some opportunities as an opener also, in addition to the names you mentioned. If the reports are right i think Sano could show most improvement this season if he can get back to recognizing pitches staying way from the slider to not become easy strike out hitter.My biggest concern is also can he hit hard throwing fast ball pitcher last year he was having hard time catching up to them. My guess he returns to player he was two years ago. Buxton is the player i have no clue on if he's going to hit or not. My gut is if he can just play and not get hurt i think one day he will figure it out enough where he becomes above average hitter. The problem i see is he play's so hard that i just think he'sprone to hurting himself never getting to point where he can figure it out. Kepler this where I am going out on limb I think he's going to become one of these quality baseball players that becomes way above average player. I just think he will become this super player that in his early years he will be able to play center field, right field and first base if needed. Later in his career he will play top right field and when he is finishing his career probably end up at first and DH. I just hope we get to see this player because I just think he is just late bloomer and we just might trade him to someone else because his numbers didn't show up as analytical people think they should. I may be wrong but what my eye see is very good player and its going to come I just not sure when it will come. He has above average speed, above average arm, very good mechanics on his baseball swing and he barrels ball very well and he hits ball hard all the necessary tools become very good player. Also has good attitude and works hard as his game from coaches and teammates. Again I think he could become one the major league all star player. If these players all have productive years the Twins will be much improved club over last year. Pitching should be adequate with enough starters if they stay healthy to carry the club. Also the bull pen is not bad as everyone thinks May has making for closer, Taylor good eight inning setup man and Hildenberger seventh or eight setup man plus couple others to mix in their in like Reed. My biggest concern is that we may hit more home runs but we will have nobody on because we lack batters with on base capabilities. We will see how year plays out. Buxton and Kepler on the other hand, I am. Buxton needs to at least show he can be competent with the bat...and Kepler needs to finally take that step forward that he's been teasing us with for 2 seasons now. My confidence in both of them is wayning, and that's what we will need to take the central and actually win a playoff game (hopefully 11 of them). Buxton is the most important Twin. His impact is magnified by how many facets of the game he brings. His defense allows pitchers to make mistakes. It allows the Twins to possible move A more bat first player into a corner OF spot. Kepler as a fourth OF'er? His arm restrains the running game. On offense, he does need to hit to at least a replacement level. But remember this. His walks become a double. He scores from second on any single. He moves IF in, and distracts pitchers while on base. There are few MLB players with his impact on the bases. He will be a straw! The one that stirs the drink? Or the one that broke the camels back? We will know by August for sure. He's one of those players of whom opponents say, "he can beat you, even when he's not hitting." Which of course indirectly underscores how important the hit-tool is in our game most of the other times. He needs to figure out breaking-pitches-away, toot sweet. While you definitely have a point, in both the beating u while not hitting, and his need to recognize the down and out stuff, I must admit I have never been called, "toot sweet" before? . I think the easiest way to explain the concept and upside of the opener is that it allows the "starter" to effectively face 22-23 batters instead of just 18. So instead of getting 5 effective innings from your "starter", you can get 6 effective innings from your "starter". Always a first time, honeybun. An opener means you are afraid that your starter is not good enough to face the top of the lineup multiple times.If I was a starter I would be pissed. To me it's always been you push off the "3rd time through the order" curse to worse hitters in the lineup, not the three or four best. You still want them to face the same "amount" of batters (in an innings pitched sense, not actual batters). It doesn't by concept want them to go "longer". It could be a byproduct, but is not the intent (to me). That is fair way to explain the concept. It way even work that way, if you can count on the opener to get thru that 1st inning unscathed. If the opener puts your starter in a hole any significant amount of the time, then the value is gone. If occasionally your opener can't get out of that first inning, you either have to bring in your starter in the middle od the inning or use up up another reliever. There are other potential downsides as well. Teams will start preparing for openers better. The idea of starting the game with what is likely your your 11th or 12th best pitcher, I don't know. Usually you use those guys for mop up,or 1 out specialists, which they can't do if you have already used them up. The other question is why does a starter struggle in the first inning. Is it really because he is facing the other teams best hitters? Or maybe it just takes an inning to figure out what's working? Maybe he will still struggle if his 1st inning is the 2nd inning. Good. And there is a solution for that, if you're the pitcher: go ahead and mow 'em down at the top of the order the third time you do face them. It just won't be in the order you originally envisioned. But with enough success they'll put you out there in the first inning eventually. Thanks, I had to go to the Google to find out what 'toot sweet' actually meant. Being from So. Mn. I could have given you a definition of "gel" and "plug it out"; but toot sweet was out of my geographical range apparently? . Wow ewen21! How did you ever remember that? I want to congratulate Cody on successfully dodging the question of who WILL show the most progression this season between Kepler, Sano, and Buxton. I've decided to bet on Buxton showing the most progression. He'll be better and show more consistency this season. I expect he'll have a couple of bad (maybe even really bad) stretches, balanced by ones where he goes nuts, but I think his baseline will be higher this year and he'll be healthy enough to play 140+ games. I'm a little worried that Kepler is who he is. I hope I'm wrong and he takes a solid step forward on offense, but I'm not placing any money on that one. Sano will almost certainly be better this year than last, but he also may end up being a somewhat one-dimensional slugger. Buxton has the most upside, has had some semi-fluky injuries that have slowed his development (Sano's leg problems are a little less fluky, I fear), and is the youngest out of all of them. If I have to pick who's going to show the most progression this year, I'll bet on Buck. The other aspect of the 'opener' that I really never see/hear much about is how it can allow the 'primary' to get a 'win' without pitching a full 5 innings. Only the 'starter' is required to pitch 5 innings to get credited with a 'win'. This could affect arbitration values if a young pitcher picks up some additional (and potentially 'cheap') Ws as a primary. Neither an argument for or against it, just another aspect of it. I saw that clip on You Tube a while back, quite unintentionally.Amazing that I remember that reference. And that is the only time I heard "toot sweet"
I got it from Chief. He got it from his great-grandchildren. / actually, for anyone still mystified, it's an anglicized corruption of the French phrase "tout de suite", meaning right away. Wikipedia says it dates back to WWI. I thought it was better known. Guess not. Do we trade Kepler when his stock is "high" and get something, knowing that Kirilloff isn't that far behind?I only say "high" because teams seem to have interest in him because of his team control, age, defense, and potential.